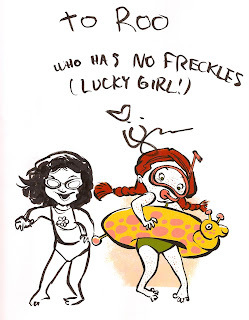 superdumb supervillain: We ♥ LeUyen! I'll admit it, I am a sicko fangirl. And these days, I am all about the kids' books. 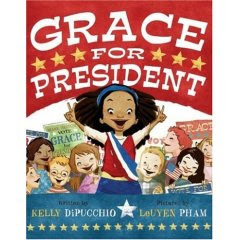 One of my favorite illustrators is LeUyen Pham. I wrote to her and asked if she would sign some bookplates for Roo's books and she upped the ante and signed the actual books for us! 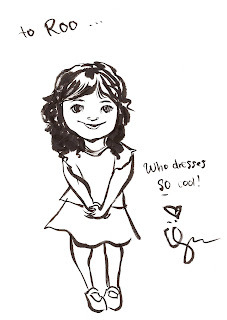 She not only illustrated Big Sister, Little Sister, but wrote it, as well. It's one of our all-time favorites! 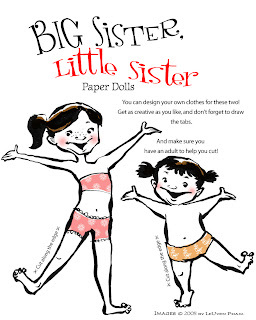 Check out these printable paper dolls from Big Sister, Little Sister. 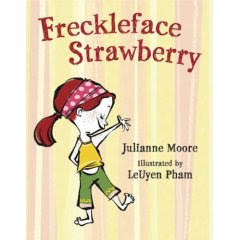 And here's LeUyen's inscription from the recent Freckleface Strawberry, a story written by famously freckled actress Julianne Moore. These are so sweet. Sometimes it pays to be a fangirl!